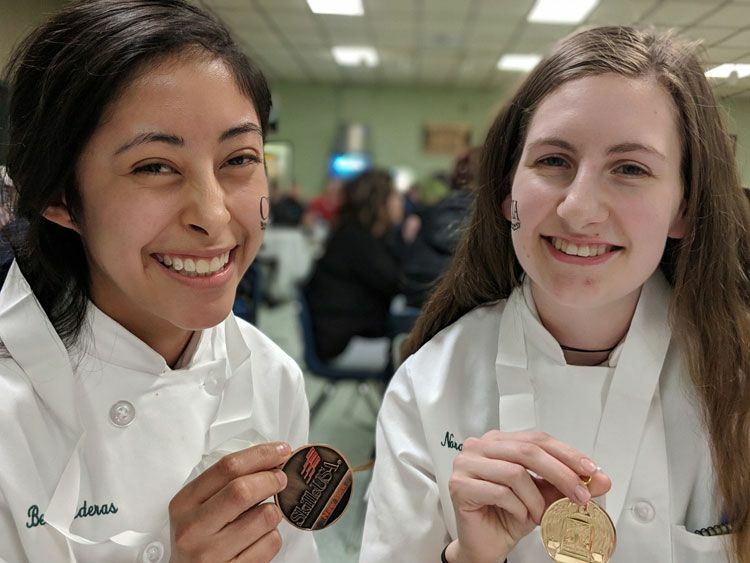 Students from The Culinary Institute of America took home gold medals in both the Commercial Baking and Culinary Arts categories at the New York State SkillsUSA competition at Alfred State College in Wellsville, NY on March 23. Nora Engelken of Fairway, KS was the winner among postsecondary students in culinary arts and Karam Lee of Salt Lake City, UT took top honors in the commercial baking category. In addition, Brandon Ting Tai Hoe of Flushing, NY was the silver medalist in the baking competition and Beatriz Balderas of New Castle, DE earned a bronze medal on the culinary side. All four are currently in their sophomore year at the CIA. "For our students who participate, competing is SkillsUSA is a valuable addition to their education," says CIA professor and SkillsUSA advisor Ezra Eichelberger. "When they prepare for competition in the various categories, you can see them develop—not only in the specific skills for that particular event, but also in their organizational skills, interpersonal skills, and overall professionalism." The students trained under CIA faculty members Lance Nitahara and Didier Berlioz. Chef Nitahara is a CIA graduate who won several culinary competitions as a student. With their victories at the state level, Engelken and Lee have earned the opportunity to represent the CIA at the SkillsUSA national competition this June in Louisville, KY, along with CIA sophomore Jerry Zheng, who will be participating in the Restaurant Service category. Since 2006, the college has had 10 gold medal winners at the national competition. The CIA will also have a representative at this year's WorldSkills competition. Julia Spondike of Lorain, OH won a cook-off at last year's nationals to earn the honor of representing the United States in the international competition in Kazan, Russia in August. SkillsUSA is the national organization for students in trade, industrial, technical, and health occupations education. It sponsors annual SkillsUSA Championships in 100 fields to recognize the achievements of career and technical education students and to encourage them to strive for excellence and pride in their chosen occupations.